Why Might You Need Customized Solutions? New antibiotics come to market. New products are developed for which diagnostic tests do not yet exist. You need to stay in front of these challenges. You need a partner like Charm. Dealing with these obstacles requires testing different matrices and various combinations to arrive at the ideal solution. Charm can adapt quickly to these needs, and through our proprietary science and technologies, provide you with a test kit specifically designed to solve your individual issues. With our vertical integration, in-house Research & Development groups, electronic/engineering/software, and immuno-assay development teams, we can customize testing solutions to meet the needs of the ever-changing world markets. Best of all, we can do it quickly, efficiently and cost effectively. Charm’s integrated solutions offer real-world, unrivaled expertise. We lead the diagnostics testing industry by offering simple, money-saving systems to predict and protect your products; your brand. Contact Charm Sciences to learn how we can customize a solution for you. 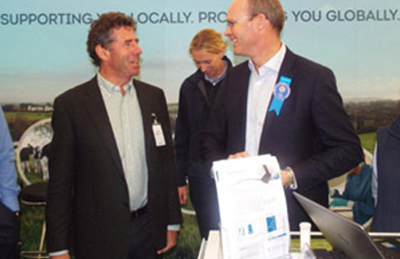 Ireland’s Minister for Agriculture, Food & Rural Development, Simon Coveney (right), and Liam Herlihy (left), Chairman of Glanbia, PLC, visit a tradeshow booth at the Ploughing Championships to learn more about a project to develop customized farm level testing. The Charm Field Incubator, and Charm EZLite system are on display.